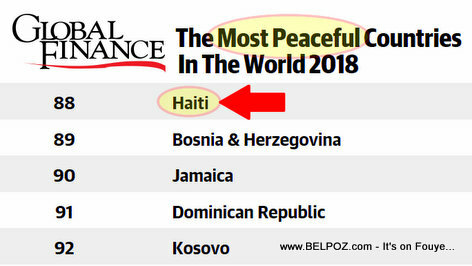 You will not believe what you are about to read but it is true... Haiti is MORE peaceful than the Dominican Republic, Jamaica and 73 other countries around the world according to the Institute for Economics & Peace (IEP) list of Most Peaceful Countries In The World 2018. Life is about perception and your perception is your reality. For some reason, Haiti is perceived as being worse than other countries that are clearly worse than we are. In reality, Haiti is better than most as far as being a peaceful country is concerned. Here is what I know for a fact. Overall, we Haitians are a peaceful bunch of people. If you don't believe me, think about this for a minute. In the Dominican Republic, there are 317 police officers for every 100,000 inhabitants. In Jamaica, there are 315 police officers for every 100,000 inhabitants. In Haiti, there are only 108 police officers for every 100,000 inhabitants and yet we wake up everyday, we greet each other, do business with each other, we have foreigners running about the country, we go about our business, we go home and all goes well for the most part. In a country where there is so much less police presence and less crime per capita, when something bad happens, it becomes a national crisis. After all, Haiti is a small country in an island where mainstream media is national and the international media corespondents all concentrate in its capital just waiting to report all the bad things that happen. It is not a lot of bad that happens but it is a big deal when it happens. Add to that the fact that there are some forces in the world who want nothing more than to make Haiti, the first black independent republic in the world born out of the only successful slave revolt in history look bad any chance they get. If you know your history, you now I am right. Haiti is a great country, we have out little problems but we're a great people. If we could only change the perception a little bit!